of the 1858 Treaty of Tianjin. Taiwan, ROC. A treaty is a legally binding agreement among sovereign states. Treaties are like contracts in that the parties assume obligations toward each other that are specified in detail in the contract or treaty. Early in Chinese history, we find examples of treaties between states (which were later unified under one government) that were designed to avert war and achieve favorable conditions for the signing parties. Similar kinds were written in Europe during the premodern era, and throughout history, across Eurasia, treaties often were made to resolve territorial disputes and to regulate trade. During the nineteenth century, international treaties acquired a new role, incorporating new concerns, such as railway traffic, road signs, naval signals, or sign language for the deaf and mute. Nowadays international treaties can address such issues as the greenhouse effect, nuclear proliferation, international property rights, human rights, and cloning. Since the nineteenth century, treaties typically identify the participating parties, usually two, and include multiple articles that specify in detail the terms of the agreement. Treaties must be ratified by the appropriate authorities on both sides before they become legally binding. In England, the terms of the Treaty of Tianjin were discussed in Parliament and in the end the treaty was signed by her Britannic Majesty Queen Victoria. 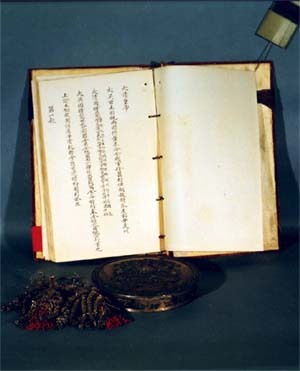 In China, the treaty was discussed by the state cabinet and then signed by Emperor Daoguang. The treaty shown in the images show in particular Articles 50 and 51 of the Treaty of Tianjin. Modern treaties also often include a favored-nation clause. Such clauses extend the terms of the treaty concluded between two specific parties to other third or fourth parties who might or might not actually sign a separate treaty. In the case of the Treaty of Tianjin, the favored-nation clause extended the terms of the treaty to Russia, France, the United States, Portugal, and Spain. To learn how to read its different parts, click HOW TO READ IT.